In his recent collection of Essays, Slouching Toward Utopia, George Schialabba summarizes the work of Ivan Illich, including Illich’s 1971 book, Deschooling Society. With that book, Illich entered a debate about the state of American schools, most of which centered on the disparity of resources between rich and poor schools. The remedy was to give more to schools that serve poor children. Illich thought such suggestions missed the point of the crisis of education. In Schialabba’s summary, Illich “thought the educational system had no good reason to exist. It was, like every modern service industry, in the business of creating and defining the needs it purported to satisfy – in this case, certification as an expert – while discrediting alternative, usually traditional methods of self-cultivation and self-care. The schools’ primary mission was to produce people able and willing to inhabit a historically new way of life, as clients or administrators of systems whose self-perpetuation was their overriding goal” (139). The problem isn’t curricular. The problem is the fact that the schools are set up to teach. Illich urged his readers to attend to the “hidden curriculum of schooling,” which was not the overt curriculum. 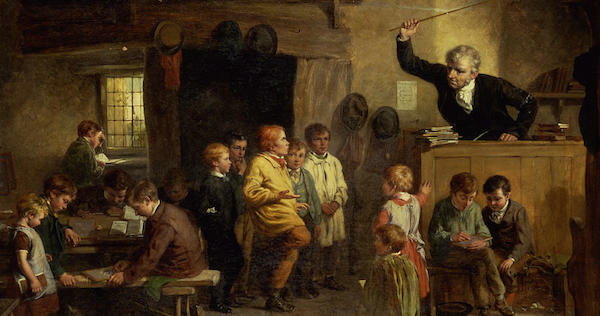 That hidden agenda was “the ceremonial or ritual of schooling itself,” a ritual so deeply embedded in the system that even the best teachers cannot dislodge it. It “serves as a ritual of initiation into a growth-oriented consumer society for rich and poor alike” (quoted 139). Students who are ritualized by this curriculum are “conditioned to institutional planning of every sort. . . . Neither ideological criticism nor social action can bring about a new society. Only disenchantment with and detachment from the central social ritual and reform of that ritual can bring about radical change” (139-40). Children need to be inducted into this consumer society because it’s “a radical novelty in the life of humankind.” Children consume “a service dispensed by someone licensed to provide it” in order to initiate them into the myth “that human needs and wants could expand without limit, that self-creation was an endless project” (141). Illich raises a penetrating test for Christian education: The issue isn’t simply the curriculum but the hidden curriculum embedded in the rituals of schooling. It’s possible to change the former without altering the latter, so that Christian education remains an initiation into consumer society. Christian education must not only attend to what is taught, but to the liturgies and rhythms by which it is taught.